Travelling between Johor Bahru and Singapore just got more convenient! 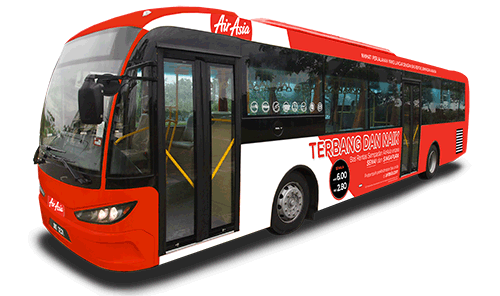 If you are arriving or departing at either Senai Airport or Changi Airport, just hop on one of our buses and zip across the border in a jiffy! Our cross-border bus service is an add-on which you can only pre-book via Manage My Booking. That means you must have already booked a flight to enjoy this service. It cannot be purchased over the counter at the bus station. We are not responsible if you are refused entry to Singapore/Johor Bahru. Once add-on is confirmed, the payment you made is not refundable. All fares shown do not include a 6% GST. You are required to fulfil the local entry requirements (visa/passport/other travel documents). Service needs to be pre-booked at least 24 hours before your flight’s scheduled time of departure. Service can be redeemed within 7 days from date of departure flight. How do I get to Kuala Lumpur city from klia2 and back? What is AirAsia Car Rental Service?